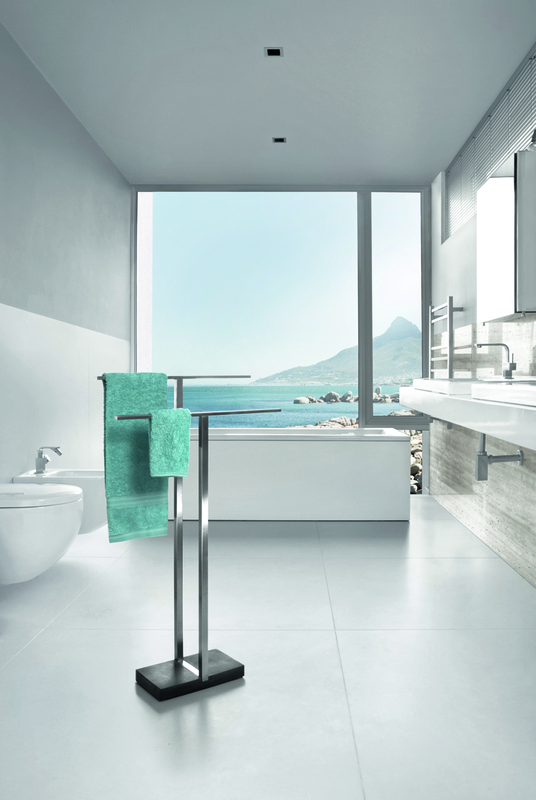 This attractive modern towel rack stand is part of the Blomus Menoto series. The Blomus Menoto Towel Stand features a space saving design. A great solution when wall-mounted towel rails are not an option. It is made and imported from Germany. This beautiful and functional towel organizer is the perfect fit in any bathroom with its understated classic good looks. Features a heavy duty polystone base. It measures 34 inches tall (height of tallest bar) x 19.75"W x 6.5"D. There is a 5" distance between the 2 bars (lots of room for the air to circulate and dry the towels). Check out our amazing modern bathroom collection for other great additions. Designed in Germany for unsurpassed precision-made quality! The aim of Blomus is to harmonize form and function and to create special products for everyday life. By creating accessories that combine simplicity of function with the beauty of the material, Blomus has created an impressive Design catalog.